Last year’s extreme drought and contractions in the mining sector have combined to strip Vietnam of its stellar economic growth for 2016, while what effect the death two weeks ago of King Bhumibol Adulyadej will have on Thailand, the nation with the fastest recovering GDP in Asean for 2016, remains to be seen. Meanwhile the Philippines remains the economic growth stalwart of the region. 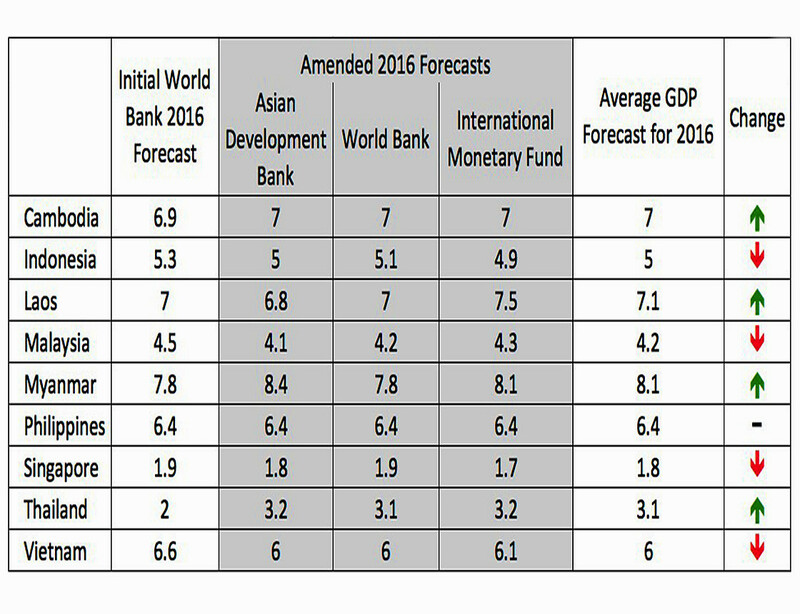 Over the past several weeks the world’s most powerful financial bodies – the Asian Development Bank (ADB), the International Monetary Fund (IMF), and the World Bank – have released a steady stream of updated forecasts for economic growth for the remainder of 2016. But what does it all mean? To save you the trouble of wading through the hundreds of pages of reports, charts, and graphs to identify the reasons behind the only very small variations between the different organisations AEC News Today has done it for you and present the aggregated results herein. Perhaps the biggest surprises to come from the latest review is the size of the speed-hump Vietnam economic growth has hit due to drought earlier this year, along with the reinvigoration of the Thailand economy. According to the World Bank report, slow industrial growth and a severe drought throughout the Mekong Delta has stunted Vietnam’s economic growth for 2016, posing a short-term risk to livelihoods, especially poor households and those who rely on farm income. 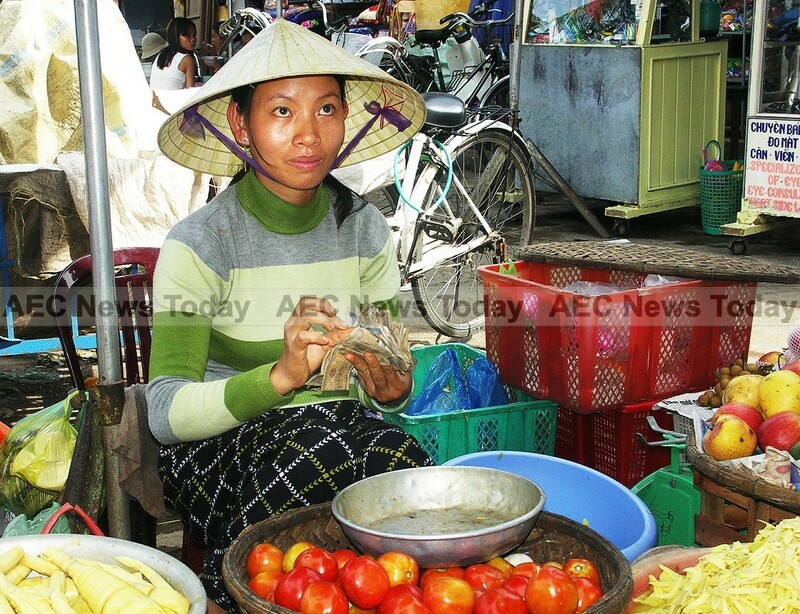 (See: Mekong Delta Drought Wreaking Economic Havoc). 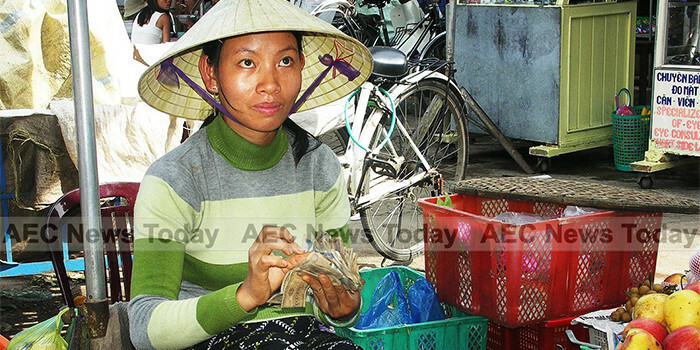 As a result Vietnam’s 2016 GDP forecast has been snipped by 9 per cent from the full year growth forecast of 6.6 per cent GDP growth at the beginning of the year to just 6.0 per cent. At the opposite end of the surprise scale is Thailand. Originally forecast to come in with Asean’s poorest performing economy in 2016, amended forecasts by all three financial bodies have seen the Thai economy transform into the regions fastest recovering; its full year economic growth forecast boosted by 40 per cent from 2.2 at the start of the year to 3.1 per cent. 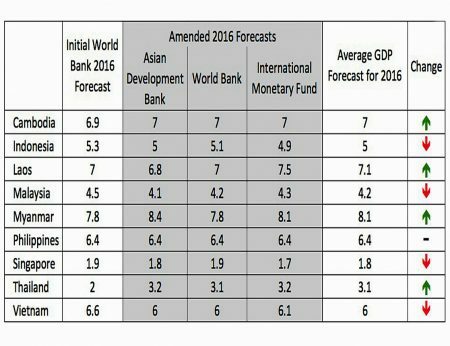 (See: Thailand Weakest Asean Economy in 2016 – World Bank). The three financial bodies noted that while Thailand’s economy is on the increase, its continuation is dependent on public infrastructure projects being implemented in accordance with government undertakings. It should also be noted that the forecasts by all three financial institutions precluded the death of Thailand’s King Bhumibol Adulyadej on October 13 and the implementation of a one year government mourning period (See: End Of Days: Thailand King Bhumibol Adulyadej Dead). With the Thai economy heavily dependent on retail sales and fiscal stimulus, and with household debt already at high levels, the view of analysts is that Thai economic growth in the second half of 2016 will now decelerate following King Bhumibol’s death. This is reflected in the ADBs report, which notes accelerated consumption and investment in infrastructure as the cause for the increased 2016 Thailand GDP forecast, while the World Bank cites a surge in in-bound tourism as a significant factor. Also set to see the year out better than originally forecast is the Asean Community’s developing economies. Myanmar saw its full year GDP forecast increase by 3 per cent from the 7.8 per cent made by the World Bank’s at the beginning of this year and is expected to see 2016 economic growth of 8.1 per cent. Also seeing an improved forecast as the year proceeds is Cambodia where 2016 GDP growth is now expected to finish the year 1.45 per cent stronger than originally forecast, the aggregate of all three organisations coming in at 7.0 per cent. Similarly Lao PDR saw its full year economic growth forecast rise by 1.43 per cent and is now expected to record 7.1 per cent GDP growth for the full 2016 year. For stability though one can’t go past the Philippines. Forecast to remain Asean’s most stable economy, the Philippines is the only Asean economy to be on course for where it was predicted to be at the beginning of the year, with 2016 Philippines GDP growth forecast unchanged at 6.4 per cent. Additionally, the World Bank says poverty is also expected to fall gradually. The new Duterte administration has laid out a ten point agenda to support economic growth in the country. It includes tax reform, enhanced public spending and continued investment in education, health, and social assistance to the poor. A positive start for a government that has been highly criticised for it’s harsh drug reform. For the economies of Singapore, Malaysia and Indonesia the news is not so good, with all seeing their full year economic growth forecasts lowered from what was expected at the beginning of the year. Originally forecast by the World Bank to grow at 4.5 per cent, Malaysia’s 2016 GDP forecast has seen 6 per cent trimmed off it and is now expected to finish the year with an annual growth of 4.2 per cent. According to the updated World Bank report, while domestic demand remains strong, external demand is slowing. Exports are projected to remain stagnant due to low commodity prices and weaker outlooks for Malaysia’s main trading partners, the report said. Also taking a tumble in the full year forecasts is Indonesia where the full year GDP forecast has been snipped by 5 per cent, from 5.3 per cent at the start of the year to a new full year forecast of 5 per cent. Noting that good government policies helped minimise the effects of El-Nino and La-Nina on agricultural production to a minimum, revenue collection from natural resources and tax collection remain weak, while food prices remain high. Although Indonesia’s exports declined in the first six months of 2016 at a slower pace than in 2015, the reports contain little optimism that the slide will halt soon. Easing further in the wrong direction of growth for the year is Singapore, who the three organisations combined provide an aggregate forecast of 1.8 per cent GDP growth for 2016, 5 per cent below the 1.9 per cent forecast at the beginning of the year. According to the ADB’s report, Singapore’s consumer price index (CPI) fell as a result of ‘declining prices for housing and utilities, private transportation, and communications. Manufacturing production has also dropped during the year as well as all exports other than oil. In addition, the Singapore government recently said externally oriented sectors such as finance and insurance had also slowed and it expected construction would slow as well’, the report stated. While the ADB, IMF, and World Bank remain generally optimistic over the resilience and gradual economic growth of the Asean Community, a common theme across all three reports is that climate change, political instability, and a lack of global demand for commodities will continue to present challenges for Asean economic growth into 2017. *Updated 2016 figures were calculated by averaging those of the IMF, ADB and World Bank. These were compared to the World Bank’s earlier forecasts made at the start of the year.